The Radio Holland Group, Electronic Systems, Marine, recently introduced a new Kelvin Hughes Integrated Bridge System at a demonstration at the New York Hilton Hotel in New York City. 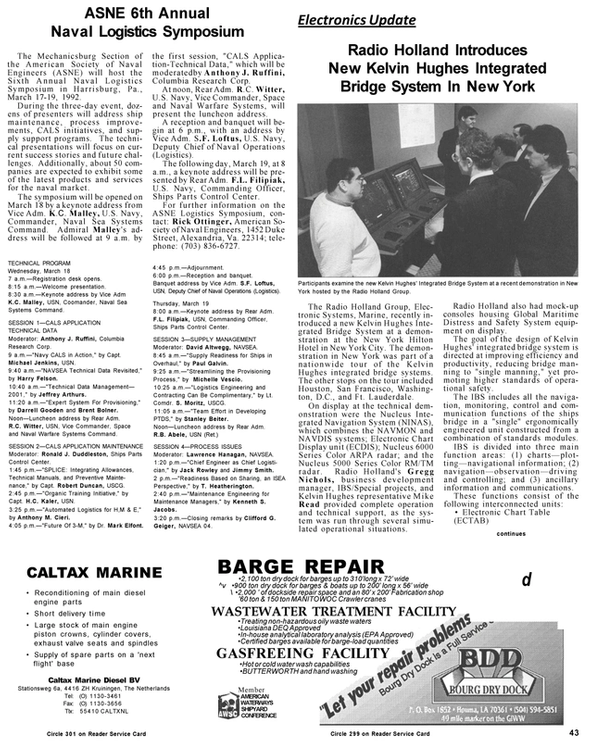 The demonstration in New York was part of a nationwide tour of the Kelvin Hughes integrated bridge systems. The other stops on the tour included Houston, San Francisco, Washington, D.C., and Ft. Lauderdale. On display at the technical demonstration were the Nucleus Integrated Navigation System (NINAS), which combines the NAVMON and NAVDIS systems; Electronic Chart Display unit (ECDIS); Nucleus 6000 Series Color ARPA radar; and the Nucleus 5000 Series Color RM/TM radar. Radio Holland's Gregg Nichols, business development manager, IBS/Special projects, and Kelvin Hughes representative Mike Read provided complete operation and technical support, as the system was run through several simulated operational situations. Radio Holland also had mock-up consoles housing Global Maritime Distress and Safety System equipment on display. The goal of the design of Kelvin Hughes' integrated bridge system is directed at improving efficiency and productivity, reducing bridge manning to "single manning," yet promoting higher standards of operational safety. The IBS includes all the navigation, monitoring, control and communication functions of the ships bridge in a "single" ergonomically engineered unit constructed from a combination of standards modules. IBS is divided into three main function areas: (1) charts—plotting— navigational information; (2) navigation—observation—driving and controlling; and (3) ancillary information and communications. These functions consist of the following interconnected units: • Electronic Chart Table (ECTAB) • Chart Display Unit (CDU) • Navigation Display Workstation (NAVDIS) • Radars • Navigation Monitor (NAVMON) • Ship Control Station (SHIPCON) • Vessel Monitoring Workstation (MONDIS) • Communication Workstation (COMDIS) As part of the IBS, Radio Holland offers the new Kelvin Hughes Nucleus radar system. This new range of radars has a simple tracker ball, with three push buttons, replacing the conventional keyboard. The comprehensive use of multiple colors based on IMO/IHO 1990 recommendations provides an easy to view display of radar picture, selectable functions, warnings, target information, and own-ship navigation data. There are five displays available in the Nucleus range: Nucleus 6000 A Automatic Radar Plotting Aid; Nucleus 6000 T True Motion; Nucleus 6000 R Relative Motion; Nucleus 5000 T True Motion; and Nucleus 5000 R Relative Motion.